I am looking forward to wrapping up 2018 with two more presentations on the affordability of computer-based social and emotional skills interventions for school-aged individuals with autism spectrum disorders. Earlier this month, I presented in Chicago at the Northern Tier Network Consortium. 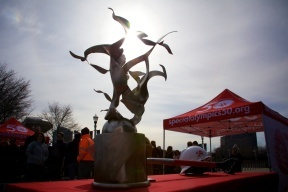 The timing could not have been more perfect with the unveiling of the Eternal Flame of Hope sculpture to honor the 50th anniversary of the Special Olympics and Chicago the birthplace of the Special Olympics. I additionally was able to attend both the Special Olympics opening ceremonies and the first-ever Special Olympics Unified Cup. This international football (soccer) tournament contains 24 women’s and men’s Unified football (soccer) teams from around the world. In September, I will be speaking at the 20th International Conference on Autism in London, England. I am the second presenter in the line up. This will be my first time in the United Kingdom and I plan to visit England, Wales, Ireland, Northern Ireland, Scotland, France, Belgium, Netherlands, and Iceland. What an exciting journey! Then I return to the states for the 5th World Autism Organisation International Congress in Houston, Texas. The presenter order should be finalized in the upcoming months for this November conference. Hopefully I things will slow down for the quickly approaching end of the year holidays.